Oxygen (O2) and carbon dioxide (CO2) chemoreception is highly relevant to multiple areas of sleep medicine. Patients with sleep-disordered breathing (SDB) may experience hypoxia during sleep, often nightly in an episodic pattern called “chronic intermittent hypoxia” (CIH), which in turn may lead to major cardiovascular complications. Some patients with SDB hypoventilate during sleep and develop hypercapnia. Hypoxemia and hypercapnia mediate, in part, arousal responses to abnormal breathing during sleep. In this chapter, we review the role of O2 and CO2 chemoreceptors in breathing control, the basic physiology of O2 and CO2 sensing, and the role of chemoreceptors in sleep-related breathing disorders, all in a developmental context. 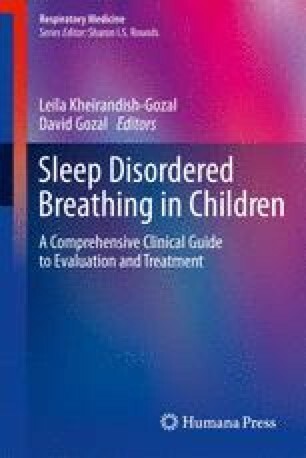 This chapter also discusses a variety of disorders associated with sleep problems, from congenital central hypoventilation syndrome (CCHS) to Prader–Willi syndrome (PWS), which are associated with abnormal chemoreceptor function.